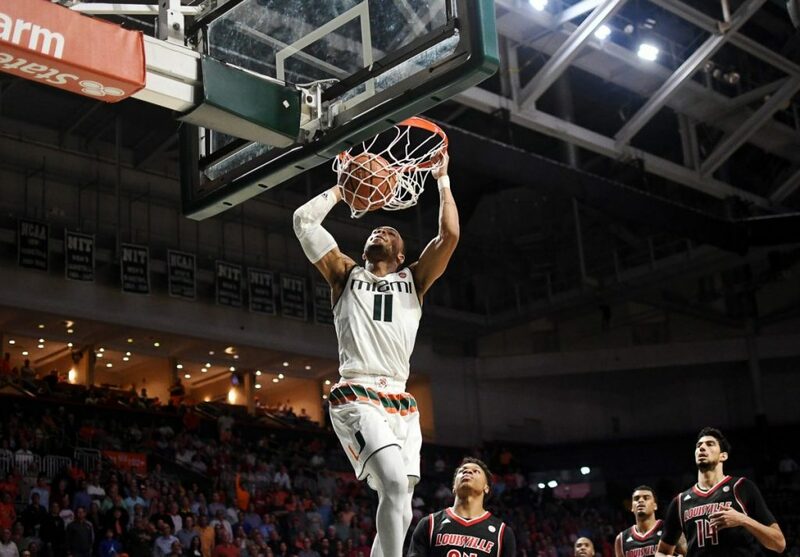 The Miami Hurricanes (15-5, 4-4 ACC) are nearing the midpoint of conference play and have shown some clear strengths as well as obvious flaws. Newton’s stats look quite different from last season, when he was one of the Hurricanes’ primary scorers. His scoring averages have dipped from 13.5 points per game to 8.5, his field-goal percentage is down and his three-point efficiency is less than half of what it was in 2016-2017. Doesn’t sound too good, right? Just from looking at the stats, no. But a deeper look into the numbers and an analysis of his play show he has made strides in a different role. Newton’s minutes are down a bit from last year from 31.4 to 26.8 minutes per game, but his shot attempts are also down by more than three shots a night, and he is averaging 1.9 turnovers instead of 3.3. 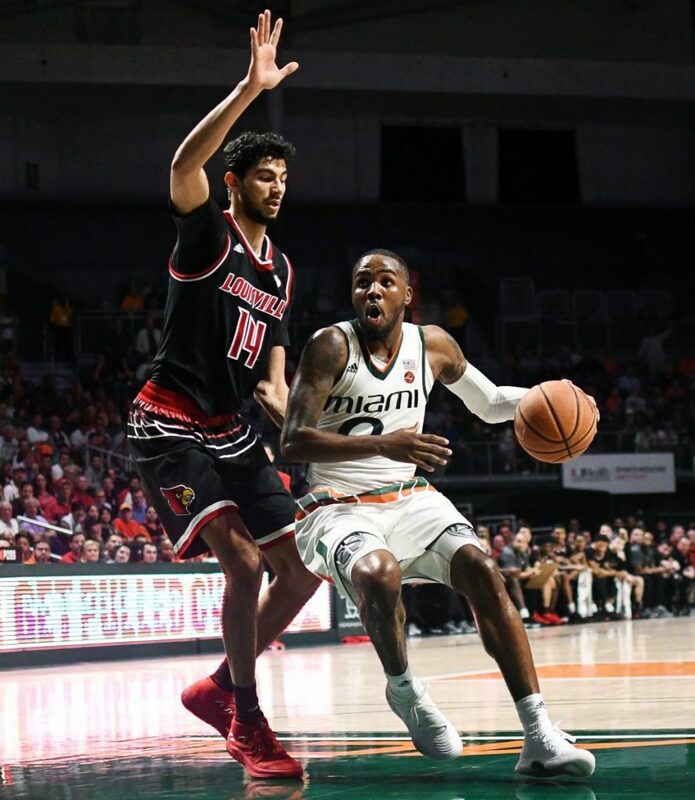 Newton has taken better care of the ball and allowed opportunities for UM’s more talented scorers to take shots, showing maturity from the senior captain. And he has clearly made defense more of a priority in his game compared to years past. Brown is Miami’s most versatile player. At just 6 feet 5, he leads the team in rebounds, assists and steals, averaging 7.1, 4.0 and 1.3 per game, respectively. But scoring, and doing so efficiently, has clearly come harder to Brown in his second year. After breakout performances against North Carolina and Duke last season, in which he scored 30 and 25 points, Brown set high expectations for his sophomore year. But to this point, he hasn’t reached them and consistency has been an issue. Brown is averaging 11.3 points per game – nearly the same as last season – and his field-goal, three-point and free-throw percentages are all down. The season is still young enough for Brown to get his shot right, but he will have to do it quickly as each ACC matchup becomes that much more important to make the NCAA Tournament. For one reason or another, Walker struggled to find his rhythm for the first couple months of the season. 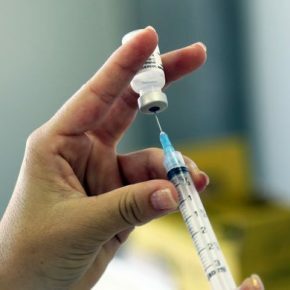 Some attributed this to the recovery process of his surgically-repaired right knee, while others said it was natural for a freshman to take some time to adjust to college basketball. But all that is behind him now, and the five-star recruit is showing exactly why he is widely considered a first-round NBA talent. In ACC play, Walker is averaging 14.3 points, which leads Miami, and shooting 40 percent from three-point range. He has scored in double figures in each of his last five games, including 23 and 25-point outbursts in his last two. Walker is just getting better, and the Hurricanes will only go as far as he takes them. Lawrence has been a bright spot for Miami in a season that has had its ups and downs. 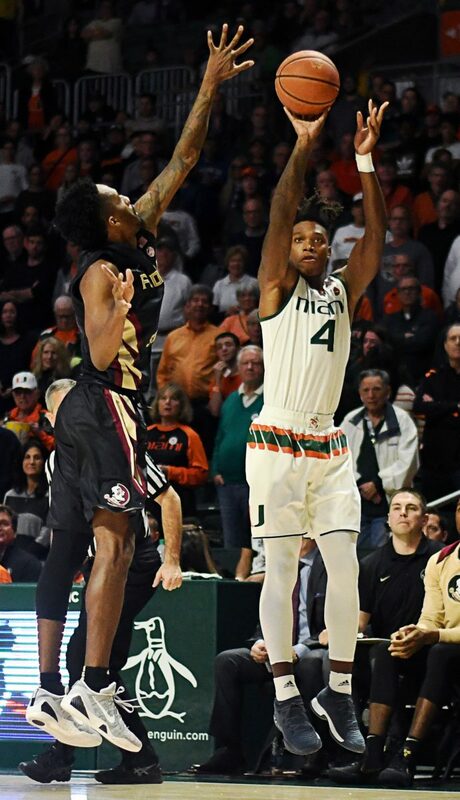 A model of consistency, Lawrence is averaging a career-high nine points per game while shooting an impressive 50 percent from the field and 49 percent from the three-point line, which leads the Canes. He is also grabbing 6.4 rebounds a night and ranks No. 2 on the team in total steals with 24. 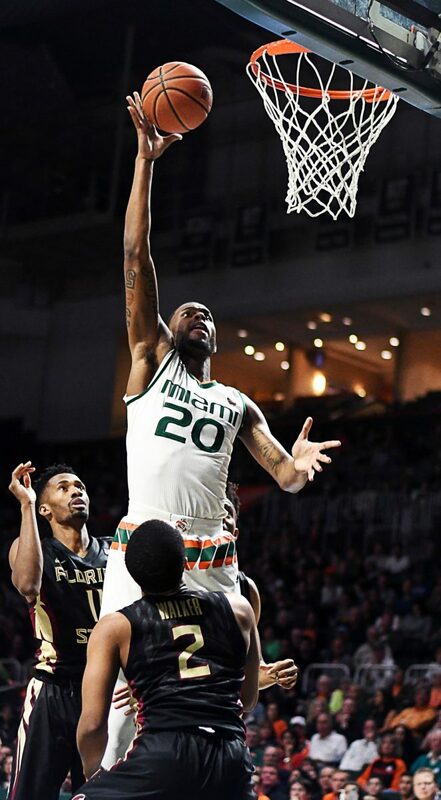 While his plays rarely jump off the screen, Lawrence has been a vital cog to the Hurricanes’ system on both ends of the court, stretching the floor on offense and guarding the paint on defense. No other Cane has made bigger statistical strides this season than Huell. After playing limited minutes his freshman year, the athletic, 6-foot-11 big man from Miami is scoring 13.5 points and grabbing nearly seven rebounds a night while also shooting a team-best 61.5 percent from the field. 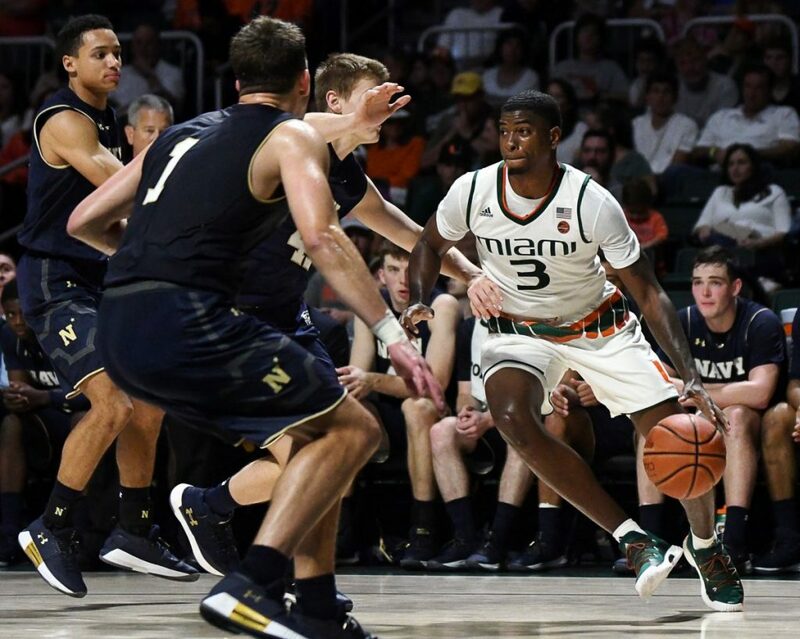 Huell has thrived in UM’s pick-and-roll offense, taking advantage of an abundance of open looks at the basket. The only thing keeping him from a perfect grade are his occasional lapses in judgement on defense. He often loses the player he is guarding or fails to box out, allowing easy dunks and second-chance opportunities for the opponent. But when Huell is focused, he is difficult to stop. He doesn’t possess a great ability to create his own shot off the dribble but has plenty of time to learn, especially in coach Jim Larrañaga’s offense.